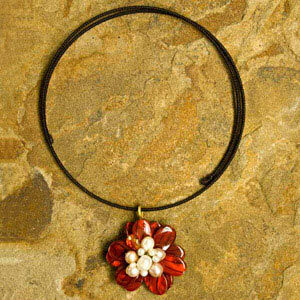 Artisan Doungnapar handcrafts a large flower from resin and cultured pearls, adding a facetted glass bead. 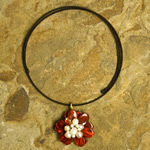 She hangs the pendant from a waxed nylon choker that wraps about the neck for a custom fit. Materials: Resin, glass, brass, waxed nylon and cultured freshwater pearl. This product was designed and handcrafted by Doungnapar Wongpae. She is very interested in traditional culture and things related to it. 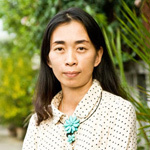 She crafts her jewelry from home in Chiang Mai. ... Read Doungnapar's biography on Ezistock Blog.